You're Going To Need A Lot Of Fortune To Win The Fortune Bundle. But That's How It Should Be. They get reprinted, mass produced and well, they're not all that collectible at all. 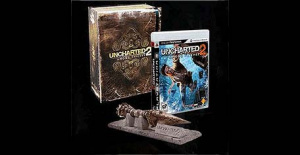 The Uncharted 2: Among Thieves Fortune Hunter bundle is a real collector's edition mind. In that you can only win it. Included in the super-rare package is a copy of the game, an exact in-game replica of the Phurba Dagger Artifact and stand, an artbook, a signed collector's case and some downloads. Naughty Dog are touting that the pack can be won on the Playstation Blog aswell as in Home and other places.